I did it! I made it to and through OWOP, wearing variations of the same pattern (New Look 6104) for seven consecutive days. 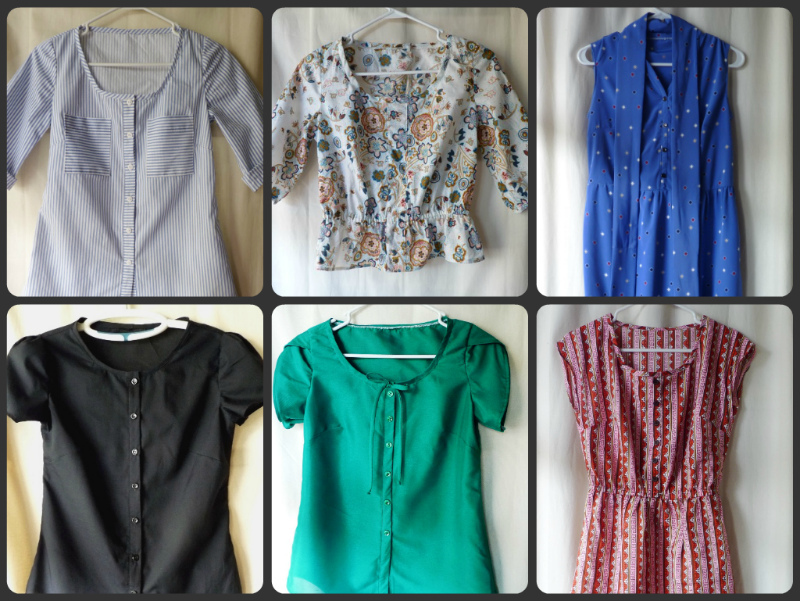 March was, by far, my most productive sewing month ever. After finishing my Hello Yellow top, I made four blouses and two (albeit simple) dresses from my OWOP pattern, plus a black skirt to wear with some of these new tops. And somehow I squeezed my life in between all of that. I guess this kind of stitching speed is what I've come to expect of myself when my sewing role models are Project Runway masochists contestants who are forced to whip up couture gown collections in a hot lil' minute. So where's my $100,000 prize and Marie Clare photo spread and Brother International sewing studio? Oh right, I only do this for fun. To remind you, here's the goofy pattern I "used," though you'll see I didn't take much inspiration from the pattern's actual details. Ruffles ain't my thing, and the pintucks defeated me and the circle sleeves looked crazy when I tried them. Fabric: Thrifted cotton sheet. I used this same sheet set previously for a skirt and the lining of my scallop tote bag, way back when I was an itty bitty baby blogger (uh, five months ago). I STILL have some left. Worn with: Jeans and striped scarf. Stripey overload? Worn with: A knit dress I bought from, ahem, American Eagle a few years ago - when I was probably already too old to be shopping there. Modifications: So many! All the details are in my previous post here. Modifications: Attached self-drafted tulip sleeves instead of the pattern's circle sleeves; made the buttons non-functional ('cause I'm a rebel.... or, my sewing machine stopped making buttonholes). Fabric: Polyester - lightweight but slightly crisp - from Jo-Ann Fabrics. Not a very forgiving fabric, but I'll blame the seamstress, not the fabric, for the mistakes. Worn with: Black twill skirt made from Cynthia Rowley's Simplicity 2250 - gathered instead of pleated. Worn with: Button-down hemp skirt made from my dad's shirt. I wore jeans to work for Denim Day as part of Sexual Assault Awareness Month (I work for a non-profit that serves survivors of domestic/sexual violence). I changed once I got home because it was 76 degrees outside and I hate pants anyway. This skirt isn't denim but it kinda looks it. And because this is SA Awareness Month, here's some education for you: 97% of rapists never spend a day in jail. * Like all Thursdays throughout the month, this was "Thursday in Black," for which staff wear black to show support for those who have experienced or witnessed sexual assault. Did you know that every 2 minutes, someone in the United States is sexually assaulted? And almost half of them are under the age of 18 (source). Modifications: Raised the neckline. And it's all French-seamed, baby. Modifications: Made short kimono-style sleeves, elastic casing at waist, plus skirt. I threw this thing together last minute (like, 1am last night last minute) so I didn't feel awesome about it, but now I like it. I had originally intended to put in a skirt lining and pockets, but forgot until everything was sewn up... cuz it was 1am last night. Fabric: Some global-themed cotton from Jo-Ann. The big Final Four basketball game between in-state rivals Kentucky and Louisville is tomorrow (Saturday) and everyone's rocking their tees, hoodies,& ballcaps. I like to take the more subtle approach to sports fandom by wearing sundresses in the team colors. Yea sportz sportz sportz! I can't decide my favorite. They're like my little OWOP children whom I love equally. Well, I could take or leave that green one. So yes, that's it! I valued my experience sewing up this pattern a million times, but I am definitely happy to move on to other things. I have so many projects in the queue. It's never enough, is it? How was your OWOP? 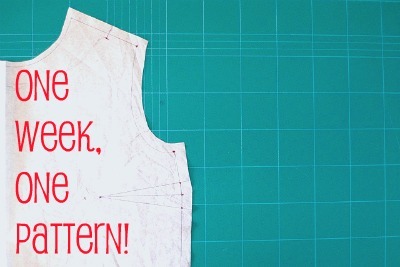 Did you (re-)discover a new favorite garment or pattern through all this? I wanna see your stuff! Leave a link to your blog in the comments if you care to, though I'm sure Tilly will do/has done a huge round-up of her own. I put your little names in five different bowls based on the patterns you wanted. To prove that I really drew who I say I drew, I took a fake vintage photo with my 21st century smartphone. Oh, weird cultural trends. Congratulations, you fine folks. I'll be contacting you directly to get your addresses, and then I'll send them to you, with love. Hope you enjoy. My spring cleaning means your spring savings! I've decided to host un petit giveaway, sponsored by my own sensibility to get rid of stuff while I'm ahead. I looked back at the photos of my apartment from when I moved in in July 2011, only eight months ago, and I just had to shake my head and laugh. It was neat and tidy, for one. But also - at that point I owned zero sewing patterns and bought fabric when I... needed it. Can you imagine? My sewing machine was out from the beginning, but I only used it to make simple curtains and hem my neighbor's shorts in exchange for his wireless internet password. Somewhere along the way, I contracted a chronic form of the sewing virus, incurable by modern medicine. The symptoms progressed rapidly: I stopped inviting people over as I was ashamed of the scraps and threads and sharp tools that littered every inch of my living room (moan), I found myself wanting to sew on Friday nights instead of go out to bars (gag), I voluntarily signed up for store mailing lists in order to get fabric coupons and be alerted to pattern sales (shiver). But the true evidence that my ailment had advanced beyond hope: I signed up for a Blogger account (scream). Yikes, so here we are. I now own ~55 patterns and have maybe ~15 stacks of fabric + scraps on a shelf that used to hold books and trinkets like a normal healthy person's apartment would. I really have no other storage, so even though my stash is relatively tame (maybe? ), I simply cannot let my sewing stuff overflow from these three shelves. That was my long introduction to this main idea: I need your help clearing out stuff I don't think I'll use. Here's what patterns are up for grabs. All of these are uncut and factory folded. You guys, I just know how adorable you'll be wearing these new clothes to all kinds of picnics and stuff this summer. If you'd like to be in the running, leave a comment letting me know which one (or ones) you'd like. You can leave more than one comment for more than one pattern if you so desire, but I'm just trying to keep them separate so it's easier to draw the winners. I'll close the giveaway on Friday March 30th at 12:00 PM (noon) EST. Then I'll announce the five winners the same time I do my big OWOP round-up post later that day or the next. Oh you thought I had forgotten OWOP? Nah, just get ready for one EPIC post. Open internationally. Let your friends know! Assuming you like to share. I reckon it's about time I share with you kind folks what I've really been up to lately, besides using the words "reckon" and "folks" ironically. I've been furiously sewing one pattern multiple times, that's what. In between March Madness b-ball games, of course. Go Cards. Tilly's hosting an "event," if you will, called One Week One Pattern (OWOP) that occurs March 26 to April 1. It's a celebration of tried-and-true patterns that are versatile and wearable on the daily, so the challenge is to wear multiple garments (or a single garment) made from the same pattern, all week long. I'm participating because I liked the idea of modifying a basic pattern to make significantly different looks. I still rely on patterns for basic shapes and fit because I don't want to spend my time determining arm hole curvature, shoulder seam width, darts, etc. when it's already accessible in a pattern. But I do enjoy the process of adding little design elements to make a truly unique garment. The pattern I'm using for OWOP is the New Look 6104 blouse. Try not to snore. I think New Look is taking their "young and fresh" styling a little far when they make a 20-something woman look like a 6-year-old girl ("Now, invert your toes and waddle like a toddler. Nice!"). But I guess I was subconsciously influenced by it, if you remember the sneak peek (well, full peek really) of one version I already made: the uber-girly floral peplum blouse. Should I wear it with Easter Bunny-bright pink pants, per New Look's suggestion? I'm much more excited about this other version, though, so instead of waiting until a grand reveal during the actual week of OWOP, I want to show it to you now. It's a dress! Oh how clever. Uh, I swear I used NL6104 to begin, but I chopped down the bodice length, curved the neckline to a more V-shape, lengthened the neck binding to form the button placket, widened the front shoulders so I could gather them, added a knee-length gathered skirt, omitted the sleeves, and created a long tie wrap for the waist. Phew. And that's not to mention the basic fitting issues I had to change -- like bust darts that sat lower than usual because there weren't sleeves to help pull up the bodice, etc. etc. I kind of regret some of the design changes, like the gathered shoulders that look more wrinkly than beautifully draped as I had hoped. I love this color blue. The little scattered red, black and white geometric squares look like confetti falling through the sky, so I'm calling it my Confetti Dress. The fabric is a swishy & slippery polyester which kinda makes me feel like I'm wrapped in a tent or something. Not very glamorous, but I'm not at a point of my sewing life where I can take the plunge into silk or whatever fancy people use. I have a strict budget and "dry-cleaning" is not part of it. "Beer" is, though. Priorities, people. OK so this is only version 3 and I want to make at least two more. The ones I've made are all colorful prints, so I'm thinking a basic black or white blouse is necessary for my wardrobe. Oh lordy, I only have ten days left! But now that I'm so familiar with the pattern, making a blouse straight from it should really only take an evening. Right? Who else is participating in OWOP? Have you decided, like me, to complicate your life by sewing up a million of the same pattern in the weeks leading up to it, or do you already have several versions of the same pattern that you're planning just to throw on? Want to add a little flare (literally) to a standard blouse pattern -- or even an existing RTW blouse? It's super simple and probably very intuitive to most of you anyway, but I thought I'd share with you how I created a small peplum on this blouse using elastic. I guess I just thought this floral print wasn't feminine enough? Seriously, sometimes I wonder what my 11-year-old Adidas-wearin' tomboy self would say if she could see me now. A peplum is a short "skirt" of fabric attached to the waistline of a fitted dress, skirt or blouse. They've become trendy again, but they seem like a pear-shaped girl's nightmare. Let's add ruffly attention-drawing volume to our already prominent hips, why don't we? Note: Cutting and re-sewing the peplum will shorten the blouse by the length of the two added seam allowances. Be aware of this and accommodate your fabric as necessary; in my case, I cut the pattern as usual and was fine knowing it would be shorter in the end. Step 1) Use a blouse that is already attached at the side seams. My original blouse wasn't that loose but did have a slight A-line shape, meaning it would create a little flare once the elastic was added. A very tight or straight blouse may not work as well. Start by marking where you would like the elastic to be. Cut along this line. You may decide not to cut at all, and simply fold the fabric to the inside before stitching the necessary seam allowance. I cut mine so I wouldn't have to measure the fold all the way around; it's an easier way (for me) to sew a more accurate line. Step 2) Turn the garment inside out and re-attach the bottom by pinning right sides together. Make sure you realign any vertical seams or stripes/plaids if you have any. Of course this method will cut into and shorten the print of your fabric, so it may be best to use a print where continuity isn't that important, like busy florals or dots instead of words or a large-scale print of your favorite celebrity's face or something, you weirdo. Step 3) Stitch using a 5/8" (16mm) seam allowance. Do not trim any of the seam allowance, but do finish the raw edge using a zig-zag stitch or serger. The seam allowance will become the elastic casing, so you can make it wider or narrower depending on the width of your elastic. Step 4) Press the seam up toward the top of the garment. I pinned it in place to prevent the bottom layer from rolling. Step 5) I planned to use 1/4" (~6mm) elastic, so I stitched about 3/8" (10mm) away from the seam line so the casing could accommodate the width of the elastic. This was basically down the center of my serged stitches. Leave an opening between the beginning and end of your line of stitches so you can insert the elastic in the casing you just made. Step 6) To measure the length of my elastic, I wrapped it around my waist where it would sit (without stretching it at all), then shortened that measurement by two inches. Be sure to check it again to make sure the elastic stretches comfortably at that length so it's not too tight or loose. Attach a safety pin to one end of the elastic and weave it through the casing, making sure the other end doesn't pull through where you won't be able to reach it. You can always pin the other end to the garment so it doesn't get pulled in... (or just hold it in your teeth like I do, ha). Step 7) Once it's weaved all the way through, overlap the two ends of the elastic, pin in place, then secure them with a zig-zag stitch. I use a short zig-zag back and forth several times so the thread is very dense. Step 8) Make sure the elastic lays flat inside the casing, then stitch the gap closed along the same line as in Step 5. This completely encloses the elastic. Step 9) Hem the garment as usual and that's it! You're adorable. You can certainly make a more dramatic (ruffly) peplum by initially cutting a bottom piece that's wider than the garment, basting some gathering stitches, then gathering the fabric before making the elastic casing. You could gather the fabric and omit the elastic completely, as long as there's a zipper or buttons of some sort to let you get the whole thing on and off. Curious about this blouse? Details about the original pattern will come later, just you wait. Hint: OWOP!